5.0 out of 5 starsFits in a Node 202! 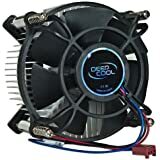 I bought this for use in a Node 202 (which it JUST BARELY fits in) to cool my i5-6600k, and while this does have a solid reputation for being one of the best low profile coolers on the market, I've been extremely surprised at how well it's performed in this particular scenario. I've been running and gaming on this system for a couple of months now, and I've yet to see the CPU break 62C, and in fact most of the time it's in the high 40's. 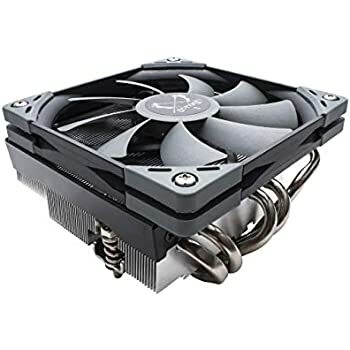 That would be superb cooling even at stock speeds, but I actually have both the CPU and Uncore ratios set to 42 across the board, putting this essentially on par with an i7 (minus the multithreading), yet this thing doesn't buckle, even in that tiny little case with no additional fans. 1. 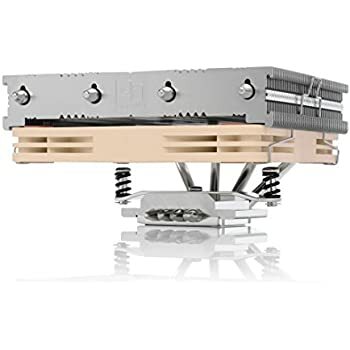 The first is pretty obvious, and it's that the width of the heatsink itself obligates you to use low profile ram if you want both to be installed at the same time. 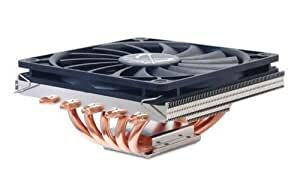 Now it doesn't have to be completely flat, I for instance am using the standard G.Skill Ripjaws V ram, which has about half an inch on top of the sticks themselves, and it does fit. I just wouldn't go with anything taller than that. 2. 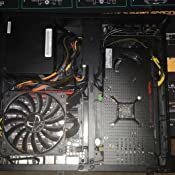 The size of the heatsink also covers quite a bit of motherboard space, which in my situation extended out to the point that it completely covered the USB 3.0 header. I ended up having to purchase a header extender from ModDIY (seemingly the only place on the interwebs that sells them, hence the name drop) in order to be able to plugin the front USB connector. Aside from those two issues, I have to say that this has been an extremely satisfying cooling solution. 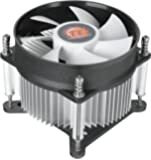 I'd happily grab one again for my next SFF build. I have not tested the performance of this product. I'm simply supplying dimension information. All measurements are in mm. Please see attached photos. 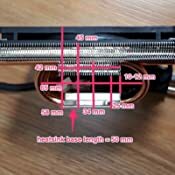 There are 5 copper heatpipes approx 5 mm in diameter. The fins are approx 0.5 mm thick. They are spaced approx 1 mm apart. 5.0 out of 5 starsThis should appear on pcpartpicker as a cpu cooler option for node 202. 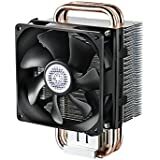 I have a node 202 with a Cryorig C7 and that cooler sounded like a jet engine on high loads with dismal temps... the wider heat spreader and the fin density on this one made it possible to keep my I7-6700k almost under 75c. 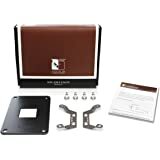 For a node 202, you will need to check your memory clearance. 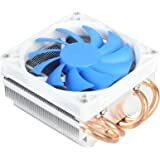 I should have bought this the first time and not waste my time with Cryorig C7. 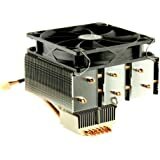 This cpu cooler does not appear at pcpartpicker website because of its memory height limitations. For beginners, this might be a challenge to install. 1. 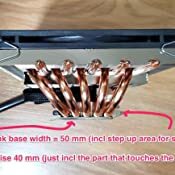 Position the Node 202 vertically where you can access the screw from the back plate and at the same time, hold the cooler in place. 3. Insert the screw into the back plate through the board AND insert the rubber washer to the screw from the inside the mother board to hold the back plate. 4. Screw in the nut and the screw thread together at the heat sink plate. 5. 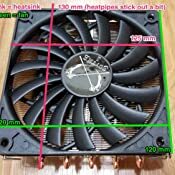 Apply TIM on the CPU and Install the Cooler. 6. Enjoy your cool temps! 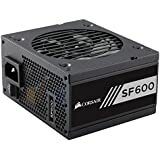 Probably the best cooler for node 202 to date. 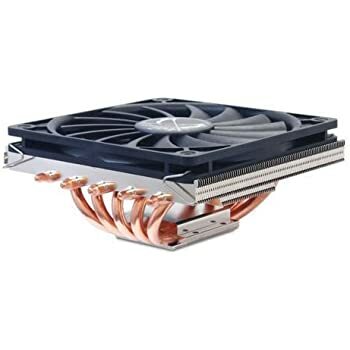 This cooler is paired up with an Asus A88XM-A motherboard, AMD A8 7600 FM2+ CPU, standard height memory, in a Cooler Master Elite 360 HTPC case. 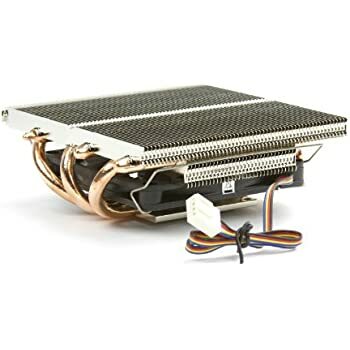 I bought this to replace the my Zalman low profile cooler due to the heatpipes leaning into the memory in slot A. The Scythe fits above, and next to the memory slot. 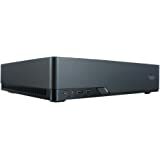 There is plenty of headroom, and I would even use taller memory if I decided to upgrade (see pic). I run the fan at full speed, and noticed the Scythe fan is a bit louder (slight whine) than the Zalman, but the HPTC sits under my TV and stereo, so it's not an issue for me. The temp differences are negligible. Approximately 2 month's in, and I've had no issues. Like the title says, I absolutely love this cooler. It works amazingly well for it's size. I found the installation to be really easy in my Socket 1151. 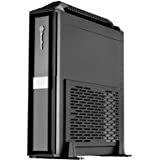 I'm using an i5-6500 and my case is the Silverstone RVZ02. I love this computer case so much but I was starting to find that the stock cooler that came with the i5 was running a little too warm. Since I got my Oculus, I've become accustomed to using my computer in a virtual desktop through the Oculus. This uses more CPU than just using the computer normally. My CPU was running constantly above 76c any time I was playing a game. I needed a compact cooler that would fit in the Silverstone. 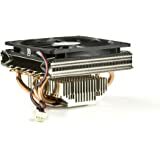 The Silverstone RVZ02 allows up to a 58mm cpu cooler. I was originally going to get the Silverstone solution, but I really liked this design better. It looked like it would allow the air to flow easier around the case. This cooler fits perfectly over my ram and leave a big enough gap that it seems to cool my entire motherboard. This cooler goes right up to the side of my case so it pulls cool air directly outside. After testing this with multiple games, I have not been able to get my i5 above 51c. I even tried doing stress tests, which I really don't like doing heh, and it just powered through them. I can't hear it at all. In a nut shell, this is a definite buy. 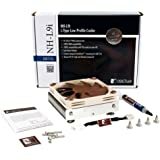 It looks really nice in the case, it provides a lot of air flow for other components, super compact, and extremely quiet. I couldn't ask for a better cooler.